The smokiness almost makes these “shrooms” taste like they were barbecued. They make a great potluck dish because they can be served warm or room temperature. Sprinkle the garlic with kosher salt and set on paper towels for ten minutes. Pat garlic dry and discard the paper towels. Place new paper towels on the plate. Heat olive oil over medium heat, in a medium skillet and fry garlic until just turning gold (it will continue to cook and you don’t want to burn it). Remove garlic with a slotted spoon to the paper towels to drain excess oil. Add mushroom to hot oil, add salt and cover so mushroom cook quickly and release their juices. Once the mushrooms get juicy, add smoked paprika and freshly ground black pepper. Cook for 5 minutes or until the mushroom juices reduce by two thirds . You don’t want them to be totally dry. 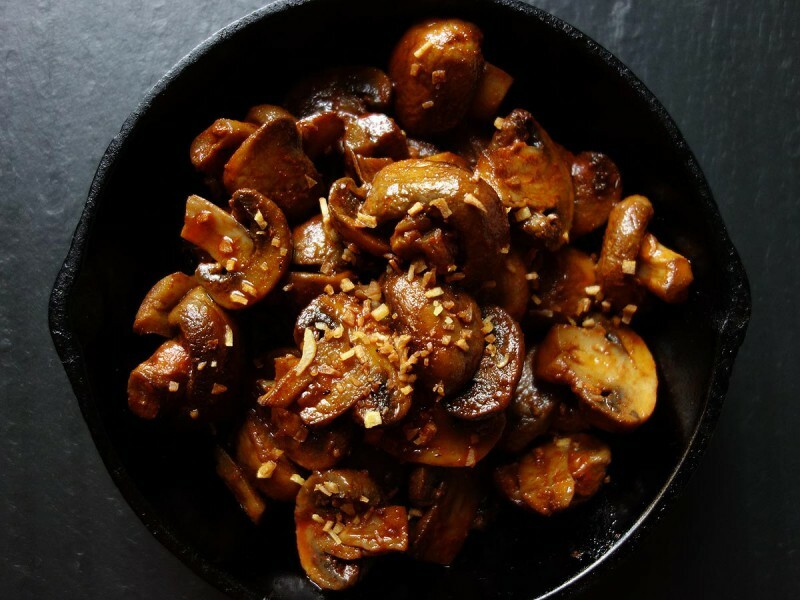 Place mushrooms in a serving bowl or plate. Chop garlic until fine and sprinkle over mushrooms. Serve with sliced bread to sop up remaining juices. Yield: 6 appetizer servings with bread. I found the smoked paprika at an Indian spice store. You can also find it online.